Why do I get a Macro security warning when opening the Plan Generator ? There are no security risks associated with this Macro! However, a generic warning message will be displayed on most systems, or Macros may be disabled. For a general overview of Macro security issues, read this article. Macros are a very useful tool to automate tasks in Microsoft Office. Unfortunately, like another programming language, it can be misused. There are Macro Virus, so Microsoft Office can be configured to request permission to run macros. Only run macros from known sources. OfficeHelp.Biz macros are Virus Free and can be open with confidence. Microsoft Office XP/2003 Warning: Macros may need to be activated. Follow instructions on the message Microsoft Excel XP/2003 will show, if necessary. Read this article for additional information. If you can open the Microsoft Excel file (both the DEMO and/or the commercial version) and get no warnings but the button just won't work, you have Macro support disabled. Please refer (click here) to our article on Macro security issues for information on how to configure Microsoft Office Macro security settings. Use the Support Contact Us page on this website. No registration is necessary. Clearly describe your problem and contact details. We will get in touch with you ASAP. Also, the generic Contact Us page is present at the top of EVERY page on this website . Click here to jump to it. Can I stop the macro while it's running? Yes. Press the ESC key and it will stop with a warning message that it was interrupted before finishing generating the calendar. Can I import Tasks lists from Version 3.0 or below? Yes. Just copy/paste the task list into version 4. The fixed columns are the same, so it will work. You CANNOT import the optional fields because they didn't exist on previous versions. What are Daily Calendar Plans? Daily Calendar Plans are calendar plans with a column for each separated day in the calendar main interval. This gives maximum detail but produces long calendars for large periods. Better for smaller periods, when details are important. What are Weekly Calendar Plans? What are Monthly Calendar Plans? Monthly Calendar Plans are calendar plans with a column for each separated month in the calendar main interval. This gives less detail but produces compact calendars for larger periods. Better for really large periods, when the "big picture" is important. What are Yearly Calendar Plans? A completely new style of calendars. They present full years on matrix of Months vs Days and therefore need no external legend for the tasks. But it is a very convenient format for year long events like meetings, holidays, vacations and long plans like software roll-outs. Can I make all calendars at once? Yes, of course. Just select "All" on the Plan Type box. WARNING: On Free DEMO Editions, the All option disables the Split By (months) field. Instead, the optimum selection for the Plan Demos in each case is used. Split By (months) will work for individual plan types. .
Name: Task name or label. 3) Press the Run button on the header to generate the calendar. 4) If not satisfied, close (dump it) the Calendar workbook generated by the macro, change the details you want and generate a new calendar with the corrected details! 5) When satisfied, save the calendar to the disk. You can now make manual changes, multiple copies and work with it as any other regular Microsoft Excel file! What about the Optional Fields? It is possible to change both 3 labels by entering new labels into cells I35, J35 and K35. These columns are optional because they can be disabled by changing cells I34, J34 and K34.If they are set to "Exclude" then the column will not be used on the plan. 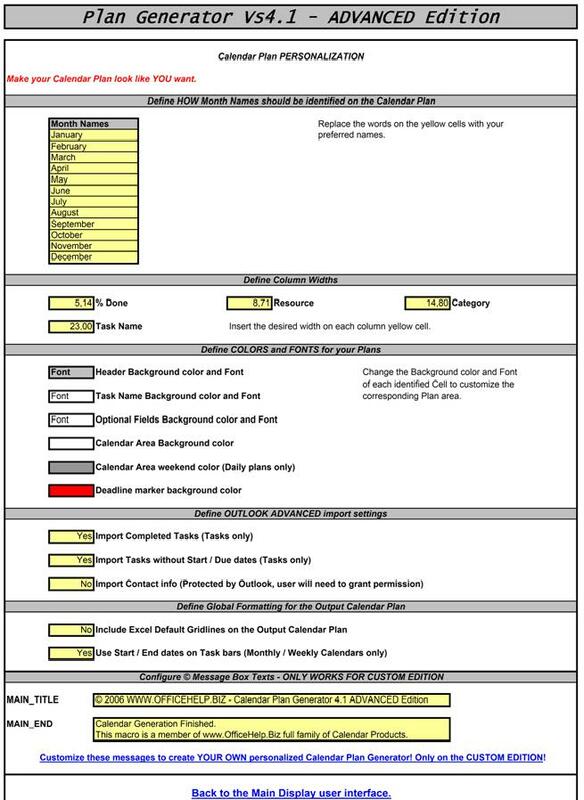 What are the customization options of the CONFIG sheet? Month names: Month names used on the calendars. Can be changed to personalize language or to shorten. Column Widths: Change column widths for the columns, so that you don't have to manually adjust them. Backgrounds and Fonts: Here you can decide how each area on your Calendar Plan can be colored. Gridlines: If Yes, the resulting Plan will have gridlines. Default is No, with a blank background. Deadline Start / End Dates: If Yes, the deadline maker for tasks on the Monthly and Weekly calendars will be its date like (dd). Outlook: Check details on the title below. To import Outlook Calendar or Tasks, all you need to do is to run the macro on the PC where the Outlook you want to sync is installed, and with the same account. For most cases, all you need to do is select the source and press the "Import Outlook" button. Task Color: Color to use for the task bar. All Outlook imported events will have this color after import. You can manually change it. Task level: Level to use for ALL Outlook imported events. You can manually change it after import. Deadline marker: Letter to use for ALL Outlook imported events. You can manually change it after import. 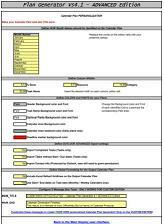 Import Completed Tasks: For Tasks only, define if tasks already completed should be imported. Default is Yes. Import Tasks without Start / Due dates: For Tasks only, define if tasks without a defined Start or End date should be imported. Import Contact info (Protected by Outlook, user will need to grant permission): Define if the Contact info of the Calendar events or tasks should be imported. This will trigger an Outlook protection and will require the user to manually accept it. Excel has a built in limit of 256 columns. Since it uses a column for each day/week, and some columns are used for data and formatting, you cannot have calendars longer than 253 days/weeks. Very long calendars can also be impossible to read once printed. The Calendar Plan Generator macro will warn you if the calendar reach the limits and propose an automatic split of the calendar into several plans. For your convenience, each calendar will have the task headings and splits are automatically made at the last full month. No months will be split in the middle. What is the "Split Every (months)" option? Instead of having very long calendars, you can have them split for you, automatically, every N months. You have to select a value from the list supplied, other values will not work. What is the "Split by" option? If your calendar plan is split, you can opt for each calendar plan to be made on the same sheet (having them all together and pre-formatted for the printer) or separated on an Excel Workbook for each. Same sheet is the default option. What is the "Include Levels" option? If you have a Task list with several levels (0,1,2…), it will not make sense to use all tasks on all calendars. 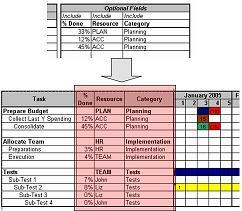 In a Monthly or Weekly calendar it may make sense to eliminate the details and use only top-level (0,1..) tasks. On a daily calendar, it makes sense to include all tasks. With this filter, YOU choose what level of detail to include. What is the "Reset Tasks" button? The Reset tasks button will delete ALL tasks on the task list. Therefore, you have to confirm TWICE the action. All existing Tasks will be PERMANENTLY ERASED. Can I change the resulting plan ? Of course. It's an Excel Sheet like any other. There is nothing special once it's generated, only colored cells and data. Can I save the Plan Generator with the Plan Data ? Can I have several copies ? Again, of course. It's a regular Excel file. There are NO MACROS on the resulting plan, only on the generator file. Can I personalize the POP-UP messages? Only on the future CUSTOM EDITION or SOURCE CODE EDITION. Changing the messages on the Config sheet will not work on this version. Can I leave a Blank line between tasks? Yes, just enter a level 0 blank task (no data or name). The supplied sample data has one (line 19). How does the Plan Generator knows when the tasks end? The macro will stop on the first task line with no data on the task level. So if you leave the task level empty on a line, it will stop there even if more tasks exist after that line.